These days, many guides to New Orleans will tell you to ‘get off of Bourbon Street’, the implication being that the 13 block strip of neon, bars, clubs, restaurants and more bars is too lowbrow for your time. To which we say: well, OK, when you’ve seen your tenth tourist sip out of a commemorative fishbowl, it’s hard to deny Bourbon can be pretty tacky. And it’s true that while there’s a lot to discover in New Orleans, there also tourists who sadly never leave the neon of Bourbon behind. But with all of that said, while it’s silly to spend the entirety of your New Orleans trip on Bourbon, it’s equally silly to never experience the most visited location in the city. This street is a tourism destination for a reason. It’s a thoroughfare with an utterly fascinating history, home to some of the oldest bars, family-run restaurants and gay entertainment districts in the country. 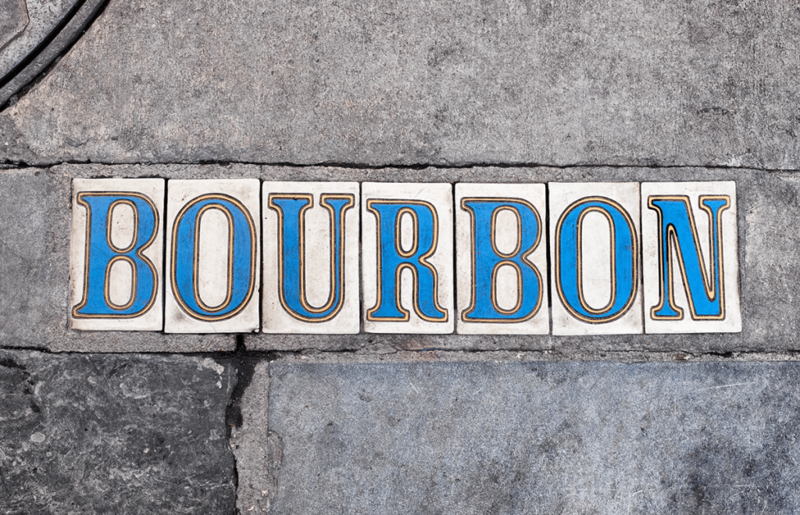 In short, while there’s plenty to discover off of Bourbon, there’s a lot to discover on the iconic street as well that may surprise those travelers who turn their nose up at all the flashing lights. Let’s start, appropriately enough, with the history of one of the oldest streets in North America. First, despite popular rumor to the contrary, Bourbon was not named for bourbon. That particular iteration of brown liquor had not even been invented when the street was laid out in 1721 by Adrian de Pauger. The street, then located in the colony of New France, was named for the French royal House of Bourbon (which bourbon, the drink, was ultimately named for). 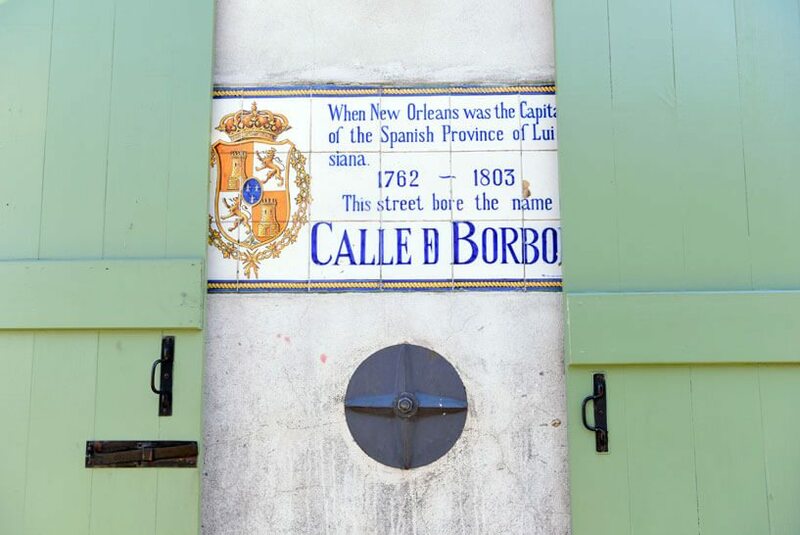 Like much of the French Quarter, Bourbon Street’s historic architecture owes far more to Spain than France; most of the street’s French buildings were destroyed in the Great New Orleans Fire of 1788, when the city was then a Spanish colony. 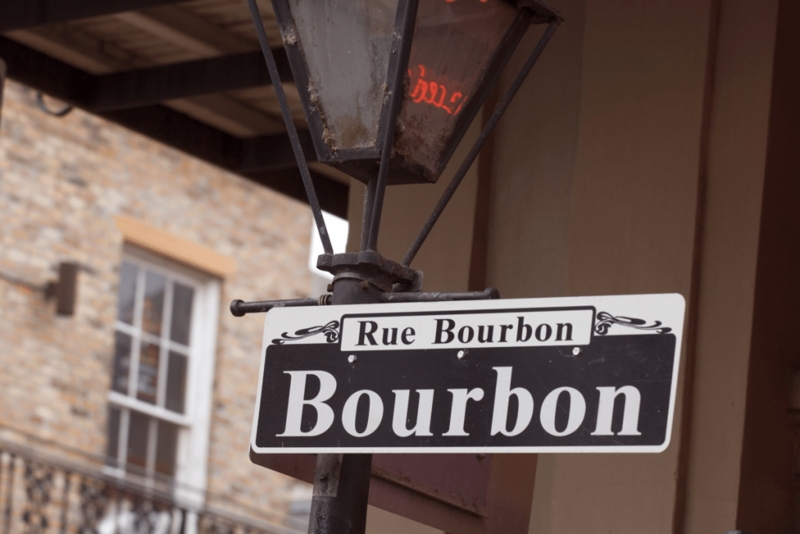 For most of its history, Bourbon was a modest residential street, populated by a mix of Creoles (New Orleanians of Franco-Spanish descent) and the successive waves of immigrants who settled the French Quarter. Bourbon began morphing into an entertainment strip in the late 19th and early 20th centuries, when the Red Light District of Storyville was established a few blocks away on Basin Street. Bleed over from the Red Light District begot a shift in the Quarter, which became less residential and more entertainment oriented. The earliest ‘jass’ (i.e. jazz) artists weren’t headlining festivals in Montreal or Switzerland – they played for customers who patronized Basin and Bourbon Street’s sweaty brothels and music halls (on a side note, those music venues stopped being quite as sweaty when they started installing round the clock air conditioning about half a century later – some of the first nightlife spots in the world to take that step). Ironically, the shuttering of Storyville’s brothels in 1917 likely accelerated the French Quarter’s popularity as a place to party. At the time, Mayor Martin Behrman said, “You can make it illegal, but you can’t make it unpopular,” and while the ‘it’ he referred to was prostitution, the legal nightlife that surrounded that practice quickly filled the Red Light vacuum. In the Quarter, the entertainment focus shifted to live music, gambling, burlesque shows and drinking establishments, dozens of which opened on Bourbon. By the post World War II period, Bourbon Street was similar in character, if not appearance, to the Bourbon Street of today, although live music was more heavily emphasized back in the day. The Meters played here, as did Dr. John and Louis Prima, among dozens of other acts that defined successive generations of American music. While there are still live music clubs on Bourbon, those venues have tended to spread into other parts of the city. On the other hand, Bourbon remains a nightlife epicenter for the New Orleans LGBTQ scene, which established a presence here in the early 20th century, when the area had (more of an) anything goes reputation. In the present day, while LGBTQ culture is thankfully accepted across the city, the ‘Lavender Line’ on Bourbon and St Ann Street still marks one of the country’s most fabled gay nightlife blocks. Bourbon Street runs 13 blocks through the heart of the French Quarter, from Canal Street to Esplanade Avenue; it becomes Carondelet Street past Canal, and Pauger Street past Esplanade. If you were looking at a map, Bourbon runs along a diagonal; confusingly to visitors, the ‘southern’ part of Bourbon (near Canal Street) is Upper Bourbon, while the ‘northern’ end (near Esplanade) is Lower Bourbon. In New Orleans parlance, Upper and Lower and refer to the upriver and downriver flow of the Mississippi. If all of the above is confusing, don’t worry – it’s more interesting trivia than vital geographic knowledge. Upper Bourbon is the area best known to tourists – the land of lots of neon, roaming bachelor and bachelorette parties, strip clubs, and enormous drinks served in souvenir cups. 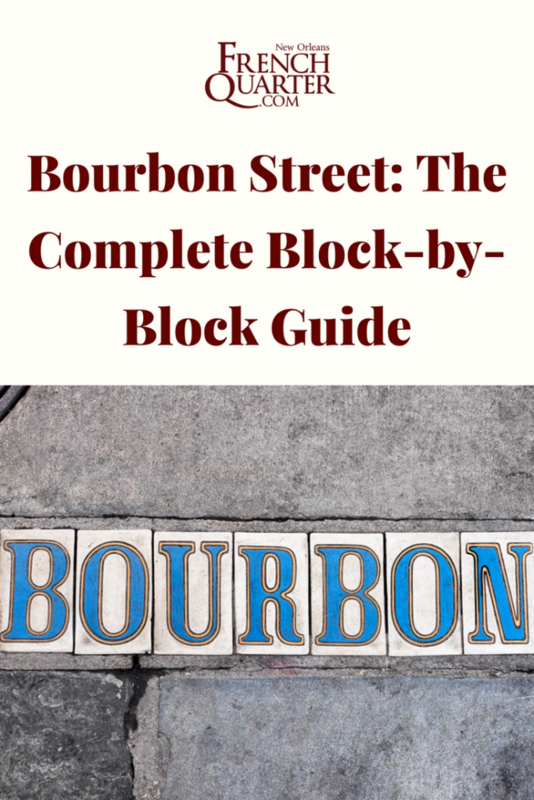 Lower Bourbon has most of the above, but not in such intense concentration; it includes the LGBTQ blocks of Bourbon. 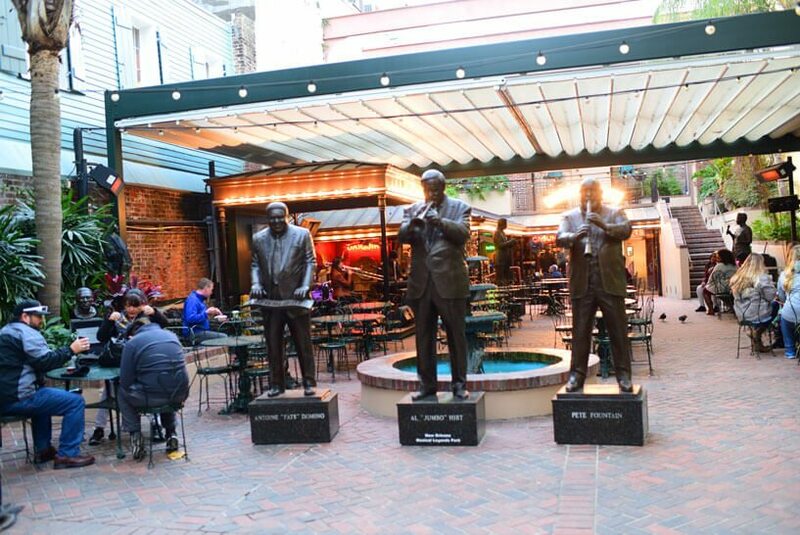 Here are some of our favorite hangouts on Bourbon Street, running from Canal to Esplanade. The Bourbon House is one of the city’s grand dame old school seafood houses. Run by the Brennan family restaurant empire, they serve excellent raw oysters, decadent ‘swamp pig’ pasta (crawfish tails and smoked pork belly in white wine cream sauce) and one of the truly great iterations of barbeque shrimp; their version is cooked in a buttery sauce that is balanced by a generous helping of rosemary. It’s heavenly. If you’re in the market for something simple and noticeably New Orleans, and you’re wandering around the 200 block of Bourbon, Olde Nola Cookery is a good choice. We basically always have time for barbeque shrimp, which is not grilled or smoked, but rather cooked in a lemon butter and pepper sauce. Plenty of gumbo and Cajun pasta dishes round out the menu – that latter category includes some delicious fare like crawfish tails served over fettuccini alfredo and a shrimp and alligator jambalaya, also tossed with fettuccini. Stepping into Galatoire’s is stepping back in time; the restaurant opened its doors in 1905, and not much seems to have changed since (our understanding is they only started accepting credit cards in the ‘90s). The cuisine is old school, heavy Creole classics – chicken clemenceau and crabmeat sardou – but folks come for the scene as much as the food. 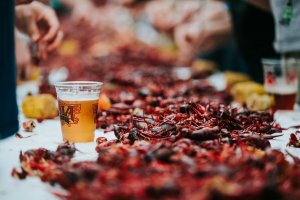 On Fridays, the oldest of old school New Orleans families line up around the block (or pay people to wait in line for them) and engage in day-long drinking and dining sessions. It’s a spectacle to be sure. For literal decades, nothing changed at Galatoire’s, one of the grandest of grand dame old New Orleans restaurants. 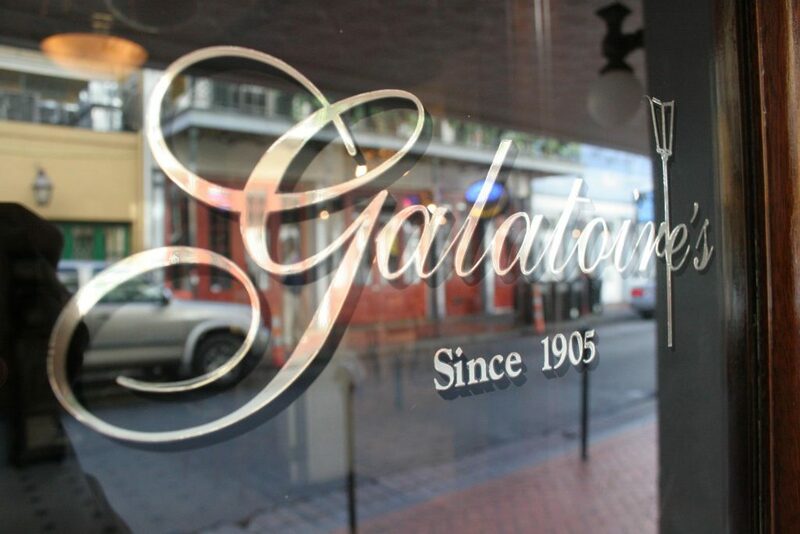 Then they went and started accepting credit cards, and a few years ago, they opened Galatoire’s “33”. The times, they are a-changing, but in all seriousness, ‘33’ has the original Galatoire’s old school charms – it just also happens to have some very fine steaks. We’re partial to the ribeye, but then again, we’re always a bit partial to ribeye. The lobster chop salad, which comes with roasted beets drizzled in an avocado tarragon dressing, is also worth your time, as is the Gouté 33 signature appetizer: three different versions of deviled eggs, gulf shrimp remoulade, and ghost pepper caviar. It’s always a good idea to sidle up to the classic copper bar, and you won’t be the first to do so: the Absinthe House dates to 1806, making it older than most American states, and has hosted Franklin Roosevelt and Oscar Wilde, among other patrons. It can get crowded, but when the bar is (relatively) quiet, we like to order the signature absinthe and dream of boozy days (and famous patrons) past. Still popularly known as Irvin Mayfield’s Jazz Playhouse, this is a legitimately lovely music venue in the heart of Bourbon Street. The lineup is straight unadulterated jazz, and the Playhouse hosts some of the most talented and exciting acts in the country. Life-size statues of local musical legends line this park, which is a (sort of) quiet respite from the noise and thrum that lines this portion of Bourbon. On a street like Bourbon, you’d think a place called ‘The Tequila House’ would be a frat boy sort of spot. You’d be wrong – this Tequila House is laid back and has a deep reserve of excellent agave-derived spirits. Leave the lemon wedge and salt at home. 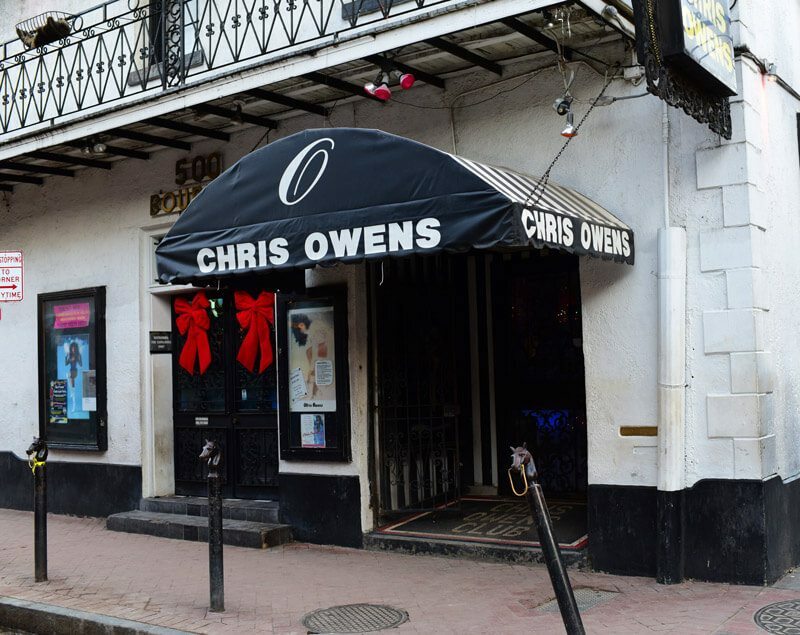 Club owner, singer, burlesque dancer and all around iconic New Orleanian Chris Owens is still going strong. Her live revue is equal parts playfully naughty and a showcase of a living legend, is one of the longest-running established shows in New Orleans, and comes highly recommended. 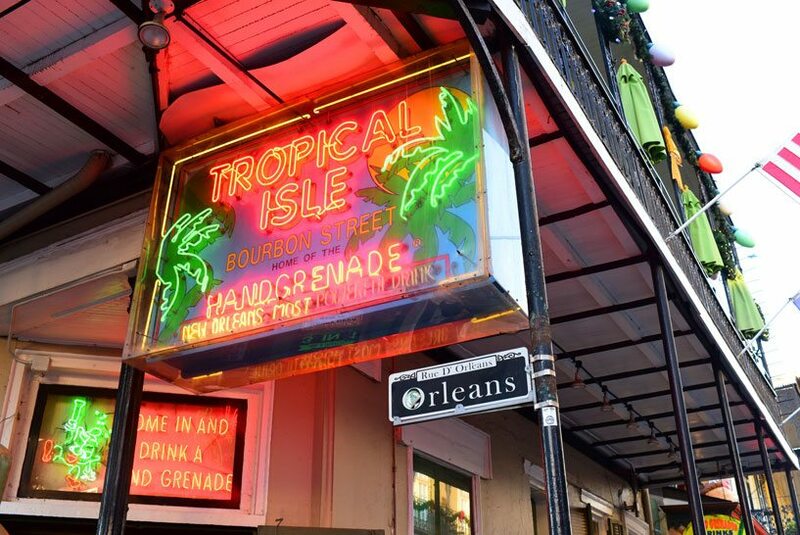 Besides the Hurricane, the Isle’s signature Hand Grenade is the most famous drink in the French Quarter. They taste like candy, but they are as strong as Hercules. This live music venue was a French-style opera house back in the day. The sign outside the door says “Dedicated to the preservation of jazz,” and Maison Bourbon does not disappoint in this regard – it’s a good spot for a live show. Has a lovely courtyard and a big balcony, but we like to pop in for the music. You’ve never heard “Sweet Home Alabama” until it’s belted out by a crowd at the Meow. We have to give this spot credit: it was an early adopter of karaoke, back when people sneered at the idea of a karaoke in a bar. The Meow’s enormous popularity is proof of the success of a then-risky business idea. While the address for Pat O’s is technically on St Peter Street, you can enter the bar complex in the middle of the 600 block, right next to Willie’s Chicken Shack. Inside, you’ll find one of the most attractive courtyards and bars in the French Quarter, which is a pleasant surprise for a lot of visitors. There are also dueling pianos. Take a seat, enjoy the tropical ambiance, and order a specialty drink – there’s the Hurricane, of course. The drinks may be sweet, but we’re not going to sugarcoat this next bit of advice: beware the Hurricane hangover. You can usually hear The Funky Pirate before you see it – it’s that sort of music club, but with that said, the atmosphere is a little turned down compared to the rest of the craziness kicking off in adjoining Bourbon blocks. Inside, you’ll find all sorts of pirate themed decor and a stage occupied by a rotating cast of musicians, who bang out blues, blues rock, jazz and New Orleans dance numbers every night of the week. This spot is part of the Tropical Isle empire, so there’s always a ton of devastatingly strong specialty drinks available. “Bourbon Street” and “quiet bar that serves craft cocktails” aren’t two concepts that seem to jive, but Bourbon “O” manages to pull it off. OK, maybe it’s not always quiet per se, but the drinks are gorgeous and well prepared, which is a welcome development at this stage during our Bourbon Street stroll. Fritzel’s is a good spot for live jazz; they regularly feature plenty of old school Dixieland. 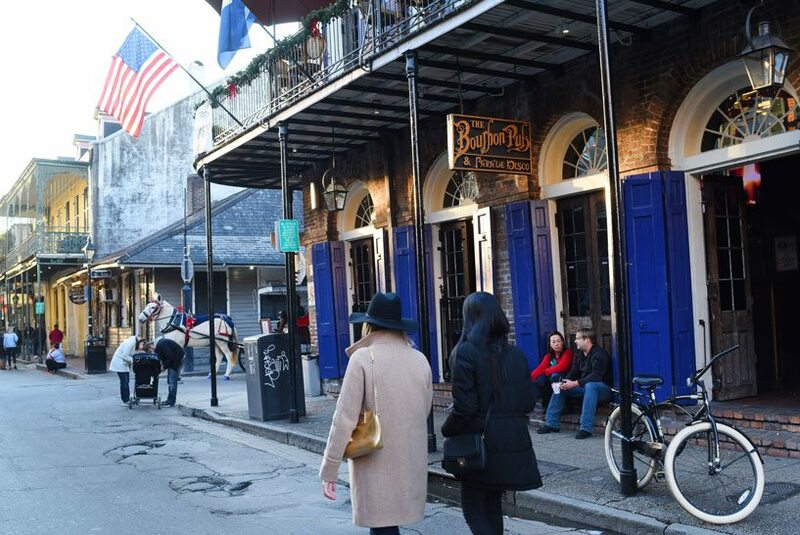 It’s calm and laid back in almost inverse proportion to much of the rest of Bourbon Street – a great stop if you’re feeling overwhelmed by all the crowds, or if you just want to listen to some good music. This is one of our favorite tourist voodoo shops. The walls are adorned with masks, gris-gris bags, spell candles and all kinds of other cool magical paraphernalia. Check out the handmade voodoo dolls fashioned from Spanish moss, and have yourself a consultation – these folks are true believers. The corner of Bourbon and St Ann Street is known as the Lavender Line, which marks the beginning of the LGBTQ section of Bourbon Street (you may also be subtly tipped off by the enormous rainbow flags). Oz is one of the more popular gay dance clubs in the city; expect drag queens, shirtless dancers, and all the rest. A 24/7 nightclub with two balconies, dance floors, shirtless folks on the bar, drag queens and a lot of unsa-unsa. The Clover is one of our favorite 24-hour diners in New Orleans (on a side note, there aren’t a ton of 24-hour diners in this city, which is a shame). 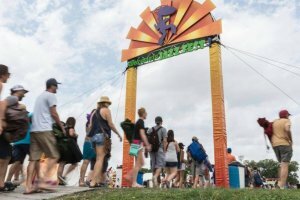 The food is great, but we really come for the atmosphere, a mix of drag queens, off work waiters, bartenders, hotel staff, tourists and musicians all hunkering down for burgers and scrambled eggs at three in the morning. The self proclaimed oldest gay bar in the country is open 24/7, and features karaoke nights, disco parties and a huge wrap around bar and balcony. It’s a little more laid back than Oz and the Pub & Parade. 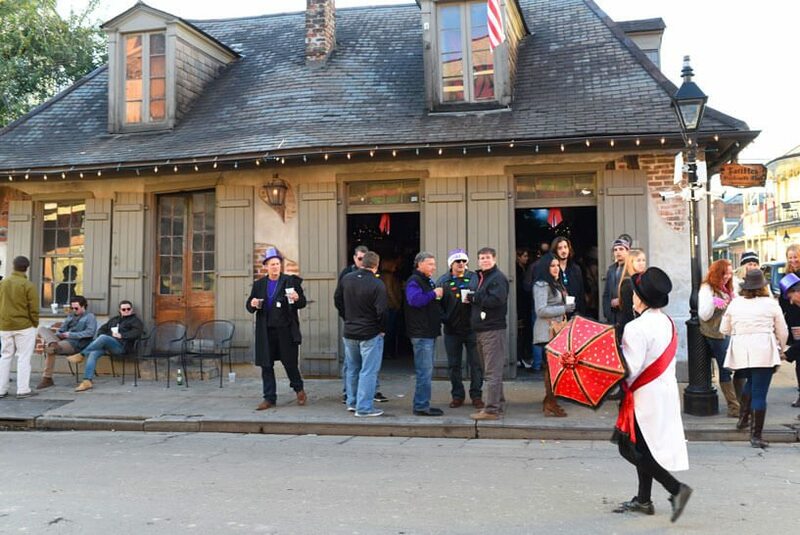 One of our favorite Bourbon Street haunts, Lafitte’s (not to be confused with Lafitte in Exile, above) operates out of the oldest building that has served as a bar in the country. It looks the part, too; the walls are all mouldering stone and wood, although the scene is pretty modern: there’s a piano bar and ‘purple drank,’ a frozen daiquiri that can quickly end your night (or to be fair, get it started).